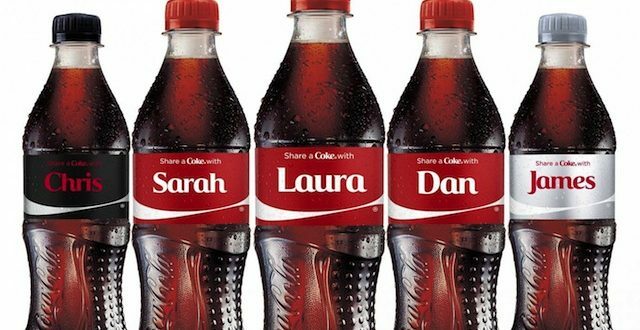 Sticky Labels Blog | Label Information | Coca-Cola Personalised Name Labels – Why It’s a Genius Idea! There’s something about personalisation that makes things that much more desirable – a personalised number plate, a monogrammed bath towel or a mug with your name on – something you can own that is truly unique. When Coke launched ‘Share a Coke’ in 2013, it was considered a cute and quirky campaign, but maybe not even Coke themselves realised what heights their marketing would reach. The simplicity of the campaign was its share-ability which is key to any good content marketing strategy – they created something that people wanted to share, photograph and tag their friends in, so their logo was plastered across the internet by their consumers themselves. This clever strategy also introduced Coke to people who may not have otherwise bought the product. As popularity grew and new names were introduced (currently 250), people rummaged through supermarket fridges in search of their name or the name of their loved ones. The hype surrounding the campaign reached a climax when mobile can makers toured shopping centres, allowing people to make their own personalised labels. 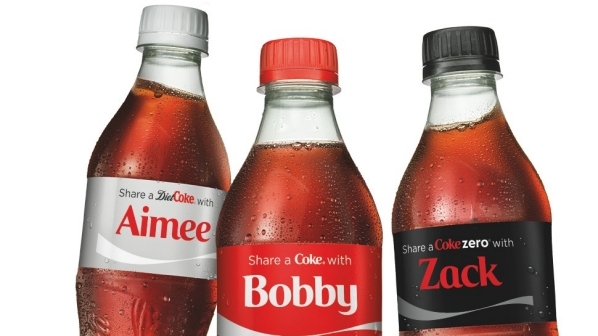 This again opened up Coke to an even wider audience – those with quirky names or different spellings, keen to own a piece of popular culture. ‘Sharing a Coke’ has become a way of showing someone you care, showing someone you miss them and a way of giving them a ‘pick me up’ or treat after a long day. The campaign gathered momentum in the news too, with debate raging around whether Muslim names like Mohammed should be included, whether the Muslim community would feel slighted if not – or insulted if they were. With some retailers claiming the campaign uplifted their sales, it’s yet to be seen if Coke’s bottom line will change long term, especially at a time when we’re more health conscious than ever before. One thing that can’t be denied though is the success of this model of self-fuelling social media content. In the first few months of launch, over 120,000 ‘Share a Coke’ tweets had been logged, not to mention posts on Facebook and Instagram – and by now this figure is likely to have doubled. Such a simple strategy – yes it was backed up by a heavy advertising and online media presence, but at heart it was cheap and simple – changing the writing on a label. This just goes to show that sometimes the simple ideas are the best.